Thank you for celebrating the birthday of Sir Thomas Sean Connery on August 25th and your interest in Sean Connery Day. This is the 4th year for Sean Connery Day. Thanks to the support of fans like yourself, SCD continues to grow in popularity every year. 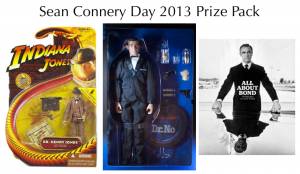 For the first time, there will be a contest giveaway where one lucky fan will win a Sean Connery themed prize pack. How to Enter: Sean Connery Day has partnered with the social TV platform GetGlue. 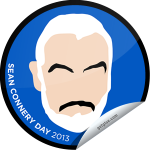 On August 25th, fans who check-in to any Sean Connery film will earn the exclusive 2013 Sean Connery Day badge – which you can order for free as a sticker to show off your Sean Connery Day fandom! One lucky winner will be randomly selected to receive the prize pack. Prize Pack: The prize pack will consist of three different items. Sean Connery 12 inch James Bond “Dr. No” figure by Sideshow Collectibles. This 1:6 scale figure was limited to only 8,000 figures and is sold out/no longer available. It is new in the original box. Sean Connery 3 3/4 inch Dr. Henry Jones figure by Hasbro from the film “Indiana Jones and the Last Crusade”. This figure was released in 2008 and has been retired from production. It is new in the original packaging. “All About Bond” photography book by Terry O’Neill. This hardcover book features over 100 photos spanning decades of Bond films. It was released in November 2012. Not only can you participate by checking in and chatting on GetGlue to your favorite Connery films, you can also celebrate with fans from around the world in other ways. You could make videos to share on Instagram, Vine, and YouTube of your SCD movie watching parties or film your best Sean Connery impressions. After all, Sean Connery Day wouldn’t be complete without talking like him too! 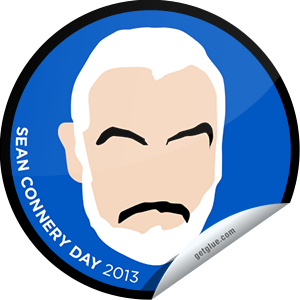 You can also join conversations on social networks with other fans on GetGlue, Twitter, and Facebook using the hashtag #SeanConneryDay. Keep up with quotes and fun movie trivia by following Sean Connery Day on Facebook, Twitter, GetGlue, and Pinterest. Special thank you to the folks at GetGlue for partnering on this promotion and Amanda Roberts Design for creating the badge design. The prize pack has an approximate value of $300 USD and was personally donated by Sean Connery Day founder Chad Elkins. GetGlue will facilitate the selection of the prize pack winner from their database of users who unlock the badge.